Lina goes WOOSH! And according to Melly, Hureika!Lyos is manlier than regular Lyos. Lawl. ENJOY, MY ADORING FANS. ENJOY! 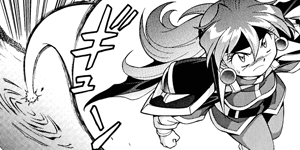 3 Comments on "Slayers Knight of Aqua Lord v6 ch29"
Aqualord is totaly one of the best Slayers stories ever!